Hey all - Denise here from Sunny Days! For February, I have this little cutie which is great for working with seasonal vocabulary. I like to leave this one at the writing center to help with spelling and word choice. Below you will find everything you need to make one of your own! Inside the bottle are 21 words that fit into three categories: Valentine's Day, Groundhog Day, and Presidents Day. 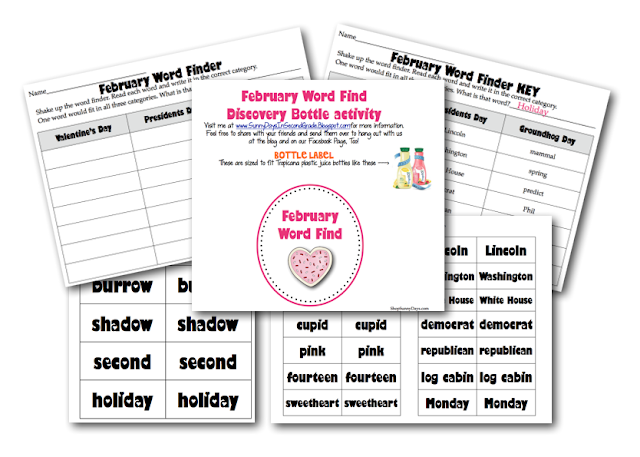 The kids will shake up the bottle and when they find a word, they'll have to decide which category the word best fits into. The word "holiday" is also in there as a bonus word that would fit into all of the categories. Just click on the picture below to download it from DropBox. I do have some helpful hints to pass along. I was dying my rice with vinegar, which is what I had on hand. It works well, but it is stinky. I bought some alcohol for this batch and it works pretty much just the same, but it doesn't stink nearly as much and it was dry in about an hour. Also, I noticed when my kids were using the antonym shaker, the word cards were getting all bunched up in the neck of the bottle. They didn't have that problem with the synonym shaker. When I compared them I saw how much less rice was in the synonym shaker...that's the only difference, so that's go to be why. Have fun shakin it up! This calls for a PAR-TAY!! !